Some dogs like to eat everything, such as your new shoes or the contents of the bin. So is it really such a big deal which dog food you choose for them? Contrary to what they would have you believe based on their chewing habits, dogs do actually require particular dietary care. 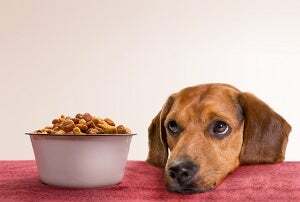 Whether it be due to their breed, age, or health status, or whether it be due to fussy tastes, there is always more to dog food than the packet with the healthiest looking dog on it. It’s also very important to consult with your vet about feeding your furry best friend, as every dog is different. Read on for a brief overview of some of the major pet food brands available in Australia, before going into further detail about how to choose the right food for your dog. 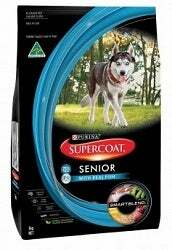 We love our dogs, which is why it’s no surprise that there’s an incredibly long list of different dog food brands available in Australia. Here, we cover the most prominent and widely available brands, but any brand’s exclusion from this list doesn’t indicate that it’s not worth looking in to. 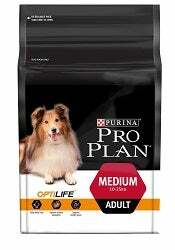 Pro Plan is a ‘super premium’ brand of dog foods designed to support dogs’ immune, digestive, and coat systems. The dry food range caters to puppies, adults, and senior dogs, and within each age category offers different food for different sized dogs as well as for dogs with different conditions, such as sensitive digestion or weight problems. In addition, there are a variety of tinned meals of meat and vegetable mixes for a tasty treat. 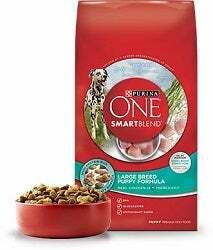 Purina One SmartBlend dog foods are a bit more affordable than Pro Plan, but are still marketed as a high quality nutrition source for all stages of life. Different nutrition priorities are covered, including grain-free, large breed (designed for joint health), sensitive stomach, and weight management. The tinned food menu covers combinations of ground beef and wild salmon, game bird, chicken and duck, turkey and venison, and other such meat combinations, as either a classic ground food or cuts in gravy. Supercoat offers dry dog food made from ‘wholesome, natural and well-balanced ingredients’ without the use of artificial colours or flavours. The range covers puppy, adult, and senior foods as well as specialised options for active dogs, different sized dogs, sensitive skin and stomachs, and weight management. As well as dry food, there’s also a large range of wet food pouches, with recipes such as casserole, mince, and loaf. Lucky Dog is an affordable dog food for that lucky (and licky) family member in your life. The dry dog food range covers two different options – Lucky Dog Adult, and Lucky Dog Minis, in smaller pieces for smaller dogs. The two adult flavours are minced beef, vegetables and marrowbone, and roast chicken, vegetables and pasta. The two Minis flavours are minced beef, vegetables & pasta, and oven baked chicken & vegetable. There are also oven-baked bone and meaty chews treats for rewarding your very good dog. Beneful offers complete meals for your canine companion, with a range of dry and wet foods. There are currently three options for dry food – Complete Health with Beef, Healthy Weight with Chicken, and Small Bites with Beef. Beneful Prepared Meals come in easy-open plastic containers that can be closed for refrigerated storage for two to three days after opening. Bonnie is a specialty brand for working dogs. Hard work requires lots of energy, including a higher fat intake to sustain endurance work, carbohydrates to readily break down for rapid bursts, and protein for muscle repair and recovery. Bonnie comes in four different varieties – Puppy, Adult Complete, Lite (for overweight or less active dogs) and Working Dog. 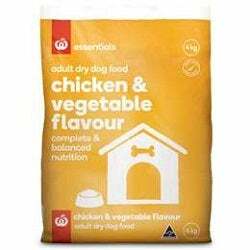 Keeping things cheap and easy, Woolworth’s own brand offerings for your pooch are a simple choice of two dry food flavours (chicken & vegetable or beef & vegetable), and two large canned flavours (beef or lamb). You can check the full ingredients list online to see if it’s the right fit for your furry friend. 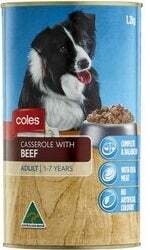 Your local Coles can offer some food types you might not find in every name-brand line – in addition to the expected dry food offerings, Coles covers tinned meals as well as chewy treats and even dog roll. There’s plenty of flavour variety among these wet food options, with a number of different casserole and loaf recipes. Buying dog food on a budget doesn’t have to be boring for your best bud! Taking a simplicity-focussed approach, Applaws dog food is grain-free, and claims to use a minimum 50% animal protein in every product. Applaws is free from artificial colours, flavours or preservatives, and promises to never use cheap and unnecessary fillers. The independent company produces a pretty diverse range of recipes, in single-serve tins and pouches, as well as dry food. Recipes range from simple chicken breast pieces, to more complex dishes such as chicken with salmon and kelp. Started by a breeder to produce a pet food solution that uses only nutritionally beneficial ingredients, Black Hawk is part of the ‘real food movement’. The brand was founded in Australia and is locally made without the use of wheat, corn, soy, gluten, artificial preservatives, colours, and flavours, or unnecessary fillers. Uniquely, Black Hawk contains emu oil which provides omega 3, 6 and 9. The brand is claimed to help pets become happier, healthier, and grow shinier coats. 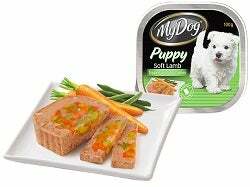 The product range covers both puppy and adult dog food. 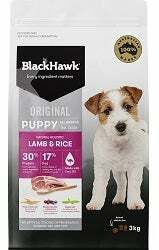 Black Hawk can be purchased from pet retail stores. Chum, with packaging featuring the iconic black Scottie dog, is an affordable favourite for canned dog food in lamb, chicken, 3 meats, and beef varieties. The brand also offers dry food. Advance Pet Nutrition is designed for Australian pets, with consideration to our climate and our typical lifestyles. The Advance dog food range covers both wet and dry varieties for premium pet food for puppies, adults, and mature dogs, as well as specialised recipes for dental care, weight management, sensitive skin, and active dogs. Wet food comes in various tin sizes (400g to 700g), while dry comes in bags of varying sizes, up to 8kg so you can keep well stocked for a hungry dog. IAMS began based on founder Paul F. Iams’ work with breeders and pet nutritionists to improve nutrition and the quality of life of pets. His work and the work of his company led to new discoveries in the field of pet nutrition. Today, the product range for dogs covers kittens, adults, and seniors, with different formulas for different size breeds as well as for weight management. My Dog is all about spoiling your special little dog. Most of the range is focussed on wet meals, but there are four different dry dog food recipes on offer. The wet food range covers a pretty staggering number of options, covering casseroles, stews, and minces with special ranges for senior dogs and for puppies. My Dog wet meals come in trays (sold individually and in multipacks) and cans. Optimum, endorsed by celebrity vet Dr Chris Brown, offers a wide range of nutrition solutions for puppies, adults, and senior dogs of different sizes. The menu covers a variety of different recipes for all categories, in dry, tinned, and tray serves. Pedigree is one of Australia’s longest-running major dog food brands, and stands out on the shelf with its bright yellow packaging. The range covers dry and canned food for all life stages and breed sizes, as well as puppy milk, dental treats, and dry food for working dogs who need that extra boost of nutrition. The wet food range covers multiple meat-and-veg combos in casserole, loaf, and other meals. There are also multiple flavours of dry food to choose from, to keep dinnertime even more exciting for your dog. Founded by a vet in New Jersey, USA, to help provide better nutrition to guide dogs suffering from severe kidney problems, Hills now is a major producer of specialised pet food for those suffering from injury or ailment. Hills started with its Prescription Diet product line, followed by the Science Diet brand and later on the Ideal Balance line. Hills Prescription Diet foods are targeted towards dogs managing or recovering from chronic or severe health issues, or recovering from surgery or other medical intervention. A few examples of these specialisations include urinary tract care, brain aging care, liver care, weight loss, joint care, and weight reduction. Each is available in a choice of dry or canned food. Hills Science Diet applies the same values of the Prescription Diet product line to food for all dogs. The product range covers life stages from puppy through senior, with specialised options for different breed types, active dogs, mobility problems, weight management, and sensitive stomachs. Science Diet covers a wide range of recipes in both dry and canned foods. Is all dog food safe and healthy? Not all dog food is the same – there can be a drastic difference between different brands and product lines. Unfortunately it can be the case that cheaper is riskier, as it may use more cheap nutritionally deficit fillers or it may not be compliant with Australian standards. This can also happen at the top end of the price range, which is why it’s so important to read the label. The Australian pet food industry is largely self-regulated. In 2011, industry representatives, the RSPCA and other relevant stakeholders developed the Australian Standard for the Manufacturing and Marketing of Pet Food (AS 5812-2011) which sets base standards for pet food nutrition, safety, and marketing. However, adherence to this standard is voluntary – check the packaging to see whether or not it states to be compliant with AS 5812-2011. Also, according to the RSPCA, the regulation of ‘pet meat’ products is seriously lacking. 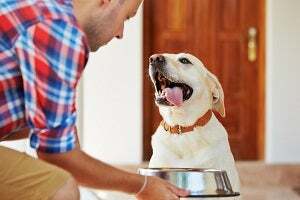 One longstanding issue with pet food safety in Australia is the use of sulphur dioxide, sodium sulphite, and potassium sulphite as preservatives. These can cause potentially fatal thiamine (Vitamin B1) deficiencies in cats and dogs. AS 5812 includes a requirement that any pet food product containing any of these preservatives must contain sufficient thiamine, to prevent a deficiency. How do I choose the best dog food? Dogs have different dietary needs at different stages in their life – that’s why you’ll see different foods labelled for different kinds of dogs. Puppies are very active and need lots of energy to grow and strengthen their bones, teeth, and muscles. Puppy food is high in protein, fat, and particular nutrients necessary for healthy growth and development. Adult dogs have lower energy needs than puppies, as they no longer need to fuel rapid growth. Excess body weight can lead to chronic health issues, much the same as with humans. Some dogs are more active than others, which is reflected by some brands targeting particular breeds or lifestyles. Senior or mature dogs are more sedentary as they spend their retirement relaxing. Senior dog food is low-fat and contains easily digestible proteins to ease the burden on their aging body. 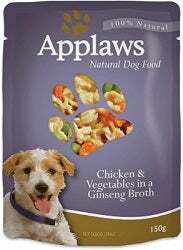 There are also specialised food products available for special needs dogs. If your dog has any chronic health issues, you should consult your vet about the appropriate diet to keep them healthy and happy. Unlike with cats, ‘fillers’ in dog food aren’t automatically bad – in fact, they’re nutritionally important (depending of course on the ingredients). For example, corn and rice are good, but corn syrup and MSG are bad. It’s also important to note that product names can be misleading. A product ‘with chicken’, for example, may contain chicken fat but no actual chicken meat. Reading the ingredients list critically is important to make the best choice for your dog. One useful thing to remember is that ingredients must be listed in order of the proportion present in the product – so look for dogs foods with filler ingredients lower down on the list and real meat or other healthy ingredients listed first. Wet food is commonly viewed as a treat, yet it’s not so well known exactly how good wet food is for dogs. In some circumstances wet food can actually be a greater source of nutrition for dogs. The most common approach is to provide a mix of both wet and dry dog food – keeping dry food as the staple, and feeding wet food for a special meal once or twice per week. The ideal balance between the two varies depending on your dog’s age, health status, and preferences. Consult your vet for specific advice. The two biggest draws of dry dog food are price and convenience. Generally, dry dog food is cheaper than wet dog foods, which can mean more money in the budget to buy treats and toys. It’s also convenient because it stores well and can be more easily purchased in bulk. Unlike wet food, which spoils quickly after opening, dry food can be left out all day without compromising safety. It can also be used with a timed automatic feeder device, handy for dog parents who sometimes aren’t home for every meal. Dry food is also good for teeth, as the shapes are designed to help clean the teeth as they’re chewed up. Sometimes dogs can get fussy. That’s where wet food can come in handy. Dogs that are unwell, ageing, or can’t smell very well may need a little extra help to get an appetite for dinner. Wet foods have a stronger smell (a very tasty smell to dogs) which can create a greater inducement to eat. It’s also easier to eat for dogs with teeth or jaw problems. In terms of nutrition, wet food can be a source of hydration for dogs that aren’t quite drinking enough water. It can also contain a higher proportion of animal protect and lower carbohydrate content. However, wet food isn’t great for dogs prone to dental problems unless they’re given alternative dental care – such as cleaning those chompers yourself with a toothbrush. Wet food spoils very quickly once opened, is generally more expensive than dry food, and must be purchased in smaller quantities. Can dogs be vegetarian or vegan? Dogs are actually omnivores, not carnivores – so it is possible for dogs to be vegetarian or vegan. That being said, as they have different dietary needs to humans, you should take particular care to make sure that you meet their nutritional needs. It can be tricky, and not all dogs will take to it. The easiest way to feed your dog a plant-based diet is by purchasing a commercially produced vegetarian or vegan dog food. Be careful, however, that you choose a reputable brand that is vet-approved and compliant with nutrition standards. One example is Australian brand ‘Veganpet’, which meets AAFCO standards. You can also feed your dog food prepared yourself from vegetables – just make sure you choose suitably nutritious and safe veggies. 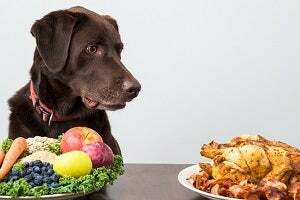 If your dog isn’t suited to a fully vegan diet, you may need to compromise by offering a mix of vegan and meat-based meals. At the end of the day, regardless of your moral concerns you’re responsible for ensuring the health and wellbeing of your precious pup. Where can I buy dog food? While the supermarket may naturally be considered the go-to for feeding your precious pet, as it is for humans, you should consider beyond supermarket shelves. 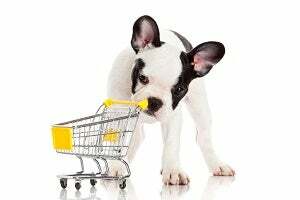 As with many products, supermarkets don’t necessarily stock the highest end or even the greatest range, although it is convenient to do your dog’s grocery shopping at the same time as the human grocery shopping. Dog food can be purchased from pet supply stores, online retailers, and sometimes direct from the manufacturers themselves. It can be cheaper in the long term to buy bulk dog food online, particularly if you’re buying the higher end stuff. Just make sure that you’re buying a reputable brand – do your research. If you’re considering an unfamiliar brand, it’s well worth your time looking for reviews and pet care forums to see what other dog carers’ experience has been with the product. Your pup’s health and wellbeing is well worth your time.